Almost a year ago we asked our users what features they wanted to see on the site next and overwhelmingly the results showed users wanted to see Complete CIB prices. We are now showing Complete prices on the site! Below is a brief description of where CIB prices can be found and a few other minor changes that CIB prices required us to make. The first change is very obvious. Between 'Used Price' and 'New Price' we have added 'Complete Price' and the volume of Complete listings. The section with prices per source has been changed to show all prices in one table. The first column is the name of the site, then 'Used', 'Complete', and 'New' columns with the most recent price at each location. The 'See It' button brings you to the product page on that site where you can buy the game. You can see all the successfully completed CIB auctions by clicking the 'Completed Auctions (CIB) tab. CIB games are less common than game only listings. Right now that means there are fewer auctions listed, but within the next couple days we will be reclassifying all past auctions as well. In the future, this feature will show you a lot more historic sales than eBay. eBay limits their historic data to the last 30 days. As you can see in the image above, we have CIB Earthbound sales going back to 2012. Please note the red 'X' next to each listing. If you notice an auction with an incorrect price or classified incorrectly, please click that red 'X'. It will flag the listing for manual review so we can fix the problem. This helps us keep prices as accurate as possible for all our users. This feature will be available by the end of the month. 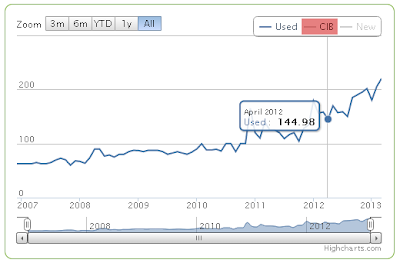 CIB on the historic price charts. By default it will not be displayed, but click the grayed out CIB on the chart and you will see historic prices for this condition. Because we just started tabulating the prices, the historic data starts now. We are looking into ways to recalculate the prices in the past based upon sales we can now classify correctly, but this might not be feasible with all products. We hope the addition of Complete CIB prices will help you in your collecting. Please let us know what you think of the new feature in the comments below. You might be wondering why it took a year to roll out CIB pricing. The feature required us to rewrite most of the backend for PriceCharting and develop some language processing to be able to determine when an listing is Complete. We look at every auction title and amazon listing description to determine if the original box and manual are included with the game. This is pretty easy for people to do but fairly difficult for a computer to do. Some people list CIB by saying "Complete" in the auction title, but sometimes they say "not Complete". Some listings will say "With box and manual" or "w/ Box & Instructions" and sometimes "without Box + Manual". Our system needs to correctly handle all of these, and many more variations, or the prices we show you would be incorrect. This system took a while to develop and test to make sure it was done correctly. In order to handle this language processing and handle multiple prices, most of our backend needed to be rewritten to make it more flexible and scalable. This took a long time but it means our site is better equipped for more features in the future. You, your team and this site continue to impress. I hope some day this site becomes the go-to price resource instead of the flawed 'that's what ebay says' rationale. How does this affect systems where the used price is complete, e.g. Gen/PS1/PS2? Will you be adding a loose cart/disc price listing in the future? @Dave - Great question. For all consoles, "Used price" is equivalent to loose price. So, just to confirm, the "used" prices for disc based games will now be for disc only/loose disc? Thats great, good job to all the team! I love these updates, the site is getting better and better even if it was the best to begin with. Used to loose would be great! This site keeps getting better all the time. Great work. Am I the only one who doesn't see this new feature? Is it even up yet? @anonymous - Please visit a game detail page like this one for Cubivore. Do you see the Complete price now? Will the new CIB prices be reflected in the downloaded price guide (excel file)? Currently, it only shows the "used" (ie. loose) prices & it would be great to have both shown! @Jason - We do have plans to add CIB prices to the downloadable price guides as part of a larger update to this feature. Hopefully these will be available for all users within a few months. I cant see listings or completed on my android app anymore. I only get charts now. @anonymous - The Android App is not an official product of ours. It is a fan made app. Our website is designed to work on all mobile devices and we recommend using the website instead of the app if you want the latest features. The only issue i've noticed with this update is that with different Models of consoles, like genesis model 1 2 & 3, that the completed listings are skewed. Some of the completed listings are for the wrong model, and some even include games or other accessories. I understand that a computer can't look at the picture or figure out that the person selling the item didnt list the correct, if any model number. @Brad - Incorrectly listed items are definitely a recurring problem. Right now we rely on users clicking the red 'x' next to a listing if it is wrong so we can manually correct it. We are always looking into ways to automate it as well because that improves the quality for all items. Are "loose" prices for disc based systems for the disc only? @anonymous - Sorry for not posting a direct comment here. We updated our methodology page last week to clarify what the conditions mean. Anything that includes words like "brand new", "sealed", etc classified as New. Anything including words like "Complete", "with Box and Manual", etc are classified as Complete. Anything that contains words like "loose", "game only", or "disc only" are classified as Loose. Loose also includes listings with no indicating words at all. For example "Earthbound Super Nintendo".